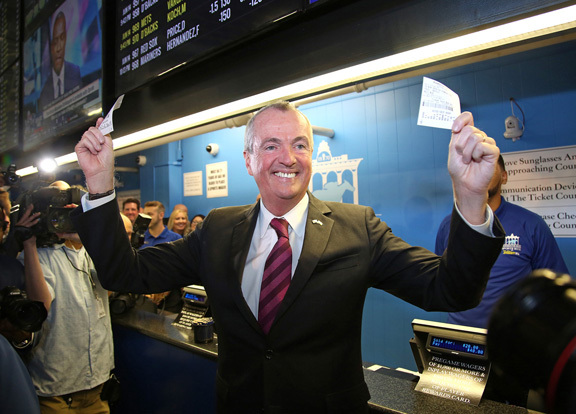 OCEANPORT, NJ – New Jersey Governor Phil Murphy placed a pair of $20 wagers to officially launch the opening of Monmouth Park’s Sports Book by William Hill Thursday morning. The first floor of the track’s grandstand-freshly painted in blue-had a Haskell day feel as fans and a large contingent of mainstream media lined up as windows opened for business shortly after 10:30 a.m.
“I’m betting $20 on Germany to win the World Cup and $20 on the New Jersey Devils to win Lord Stanley’s Cup,” he said to a large round of applause. The Oceanport racetrack, which was at the forefront of a push to legalize sports betting outside of Nevada, became the first location in New Jersey to accept sports wagers after the Supreme Court struck down a federal law barring wagering on team sports May 14. The stage was finally set Monday when Governor Murphy ended a prolonged delay and signed a bill authorizing licensed racetracks and casinos to begin conducting sports betting. Dozens of TV screens flashed odds for just about every sporting event you could think of, including’s Thursday’s first round of the FIFA World Cup, which began at 11 a.m., the US Open, and the day’s Major League Baseball lineup. Future wagers for popular events such as the Stanley Cup, Super Bowl, NBA Finals, World Series, etc., were also available. 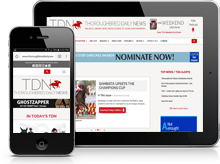 Dennis Drazin, chairman and CEO of Darby Development, operator of Monmouth Park, leading trainers Kelly Breen and Jason Servis, and popular track announcer Frank Mirahmadi were among the enthusiastic crowd on hand showing support for the home team. Former state senator Raymond Lesniak, Assembly Speaker Craig Coughlin, and Joe Asher, CEO of William Hill U.S., were also in attendance. Nearly 1,000 patrons made their way to the 15 designated sports betting tellers in the grandstand and additional six in the William Hill Race and Sports Bar. Hazlet, New Jersey, resident Wayne Szpara, a union electrician of Local 456, was among the first to get a bet down Thursday morning. NBC cameras followed professional sports handicapper Joe Wisniewski of Joe Wiz Sports Picks as he made his move to the windows as the lines began to slow down a bit just after 11:30 a.m.